As the drama surrounding Madison, Carmen, Gaby, and Kate is played out in front of the cameras and the relentless paparazzi, the girls quickly discover that fame comes at a price. 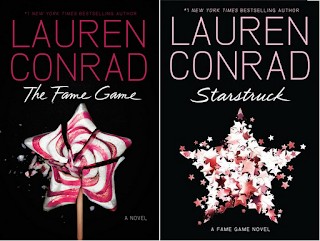 Featuring hot new characters and old favorites from the #1 New York Times bestselling series L.A. Candy, the second Fame Game novel chronicles the rise and fall of Hollywood’s newest reality stars. Anyone who has ever wondered what it is like to make it in Hollywood will love this fun, addictive series written by someone who has seen—and lived—it all. Full of dishy details about young Hollywood that only an insider can reveal, bestselling author, fashion designer, and television star Lauren Conrad shows that the real drama happens behind the scenes. hei iar ne incanti cu carti de lauren, mi-am comandat prima serie la candy de pe net si mi-a placut mult acum astept sa imi vina si primul volum din seria asta. si eu sunt foarte curioasa ador copertile. si de multe ori cumpar carti dupa coperta....stiu stiu povestea poate sa dezamageasca dar asta e.
si eu aud pt prima oara de cartile astea si de lauren conrad.